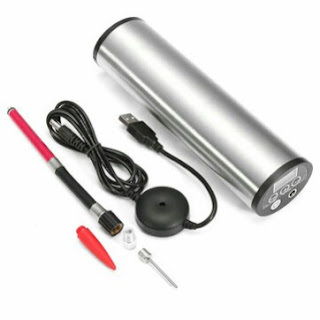 • Portable Air Compressor Pump Mini USB Rechargeable Digital Tire Inflator. • Lightweight, compact and easy to carry..
• Features two LEDs and can be used as flashlight or nightlight..
• Connvenient to use. Simply switch on, connect the necessary nozzle with the preferred PSI and inflate..
• Shuts off automatically when done and not in use after awhile..
• Maximum charging pressure is 150-PSI..
• 10.3Bar, 990KPA, 10.5kgf/cm², 12LPM Flow..
• Features backlight LCD screen display and a universal USB charging cable..
• Power: 5A Current, 15V Voltage..
• Rechargeable Lithium Battery Type..
• About Two hours Charging Time..
• Size: ~ 55 x 45 x 198mm..